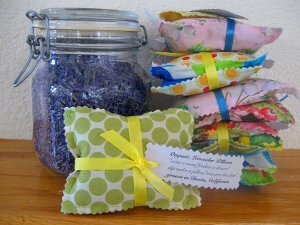 These Lovely Lavender Sachets from Jen Hagedorn make great gifts for family and friends. Drying lavender for sachets is so easy! Put these sachets in closets and drawers to keep your clothes smelling lovely! 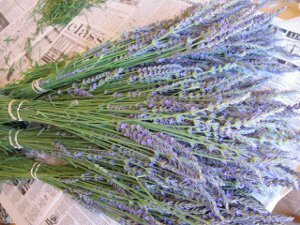 Bundle lavender into bunches about as thick as your wrist so they aren't too crowded. Rubber band the stems, pretty tight, because they lose some volume as they dry and you don't want them falling all over the place. 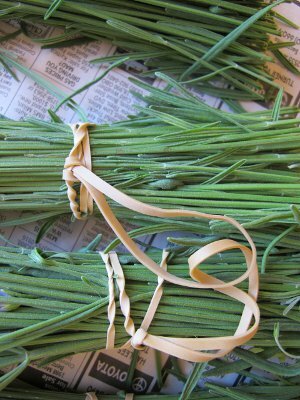 Slip another rubber band through the ones holding your bunch, then loop it by pulling one end through the other to form a hanger. Hang them in a dry place out of sunlight. Put a piece of newspaper on the floor beneath them to catch the flowers that fall as they dry. You don't want to waste any of these fragrant beauties! In about a week they should be crisp but still have their color and fragrance. Take them down. Put the bunches in an old pillowcase. Rub gently, like you are rolling the bunch, and the flowers will separate from the stems. Collect the flowers in an airtight container. 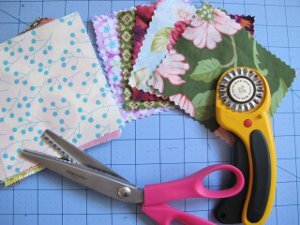 For fabric, you can use pre-pinked charm squares, you can cut your fabric using a pinking rotary cutter, or you can use pinking shears. I like them no larger than 5" on a side and no less than 3". Lay two pieces wrong sides together. 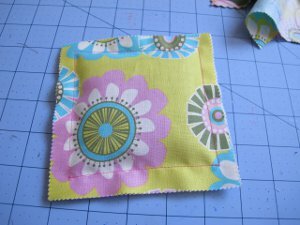 Use a 5/8" seam allowance, and beginning 5/8" from one edge, sew three sides using a straight stitch. Don't forget to backstitch at the beginning and end, and end 5/8" from the unsewn edge. Choose a thread color you like, because your stitches will show on your sachet. Now fill it. You don't want to fill it too full or you won't be able to sew it shut, and you'll just be wasting lavender because a little goes a long way. 1 ounce should do it, which for my 5" x 5" charm square is about 1/2 way full. 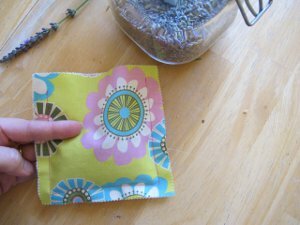 Keep the lavender packed down away from your unsewn edge, and then sew the remaining edge, being sure to cross over your original stitches, and backstitching at the beginning and end. 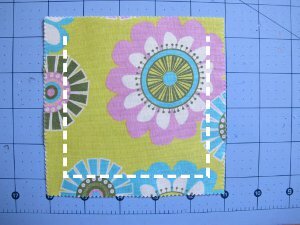 can i use precut quilting squares? The diresctions are simple, easy to understand well done! These are lovely. What does your tag say??? How much do think this one would sell for? Love this idea but have one HUGE PROBLEM. Where do I get lavender in Orlando Florida. DOes anyone have a good cheap source? We can make these for our next church bazaar. send info to me: nannyglo@cfl.rr.com and thank you. Happy New Year. You should be able to get lavender at any Health food store. Ours sells it in bulk loose. Good luck. I grow plants (they grow great in Las Vegas) at Purple Haze Lavender on the internet. Do a search and it will bring it up. You can buy plants there, or the seed. Hope this helps. Purple Haze is great! I buy my lavender, dried, at a health food store in Belfast, Maine. I'm sure that many health food stores must carry. 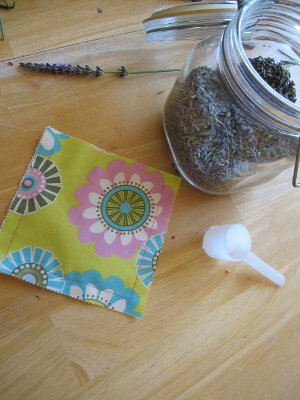 I have lots of lavender and I'll look forward to making these sweet sachets.